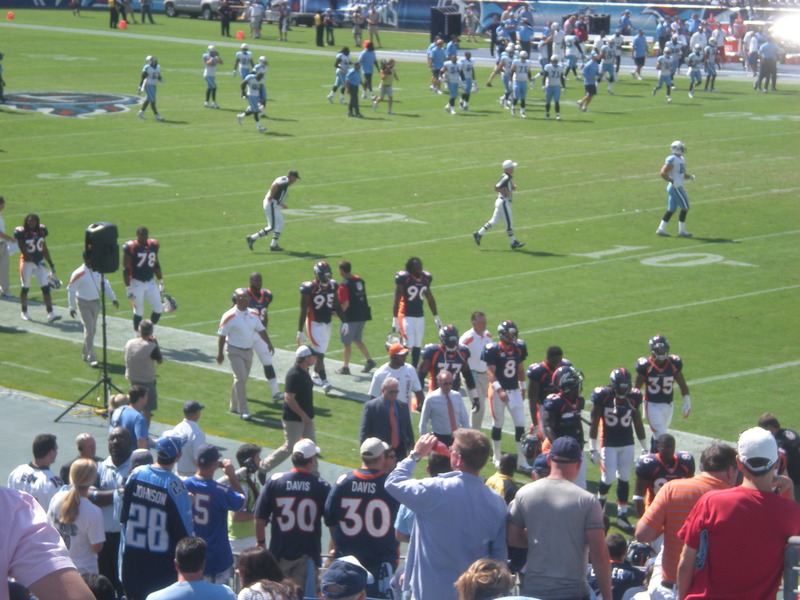 I went to Nashville Sunday to cheer on my Denver Broncos against the Tennessee Titans at LP Field in Nashville, just as I did 51 weeks ago. Unfortunately unlike last year, my Broncos lost 14-17 to the Titans. It was still a great game though, mostly because I got to see John Elway. I saw him come out of the tunnel and ran toward him. I got halfway down the stairs when the usher stopped me because my seat was not down in front. I tried to explain to him that it was JOHN ELWAY and I love JOHN ELWAY, but he didn’t let me pass. He did, however, laugh at me as I screamed and squealed and shouted JOHN JOHN JOHN! I was shaking and SO excited. I’ve been to games and have seen John Elway play 4 times in his career, but I have never been that close to him. Unlike last year when I spent the entire weekend in Nashville (my birthday weekend), this year I just went to Nashville for the day. I couldn’t take the time off from packing for my move or spend the money to stay in Nashville overnight. Plus my mom was flying in to help me pack and move, and Southwest doesn’t fly into Memphis. I left Memphis 7am Sunday morning, parked at Big River Grille where I was meeting Mom after the game, walked across the bridge and was in my seat at LP Field by 10:30am. Of course I was dressed head to toe in Broncos orange, including my orange cowboy hat and orange Broncos jersey. 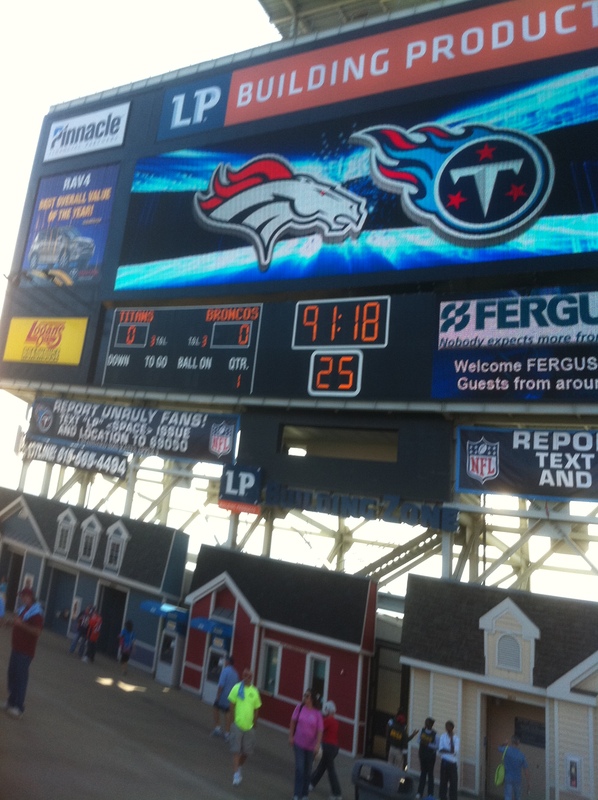 The Broncos scored first, but the Titans quickly tied it up. The refs made a lot of bad calls in Denver’s favor. I forgot what big boo-ers Titans fans are. Mom texted at the end of the 3rd quarter to say she had landed and was in a cab on her way to Big River Grille. 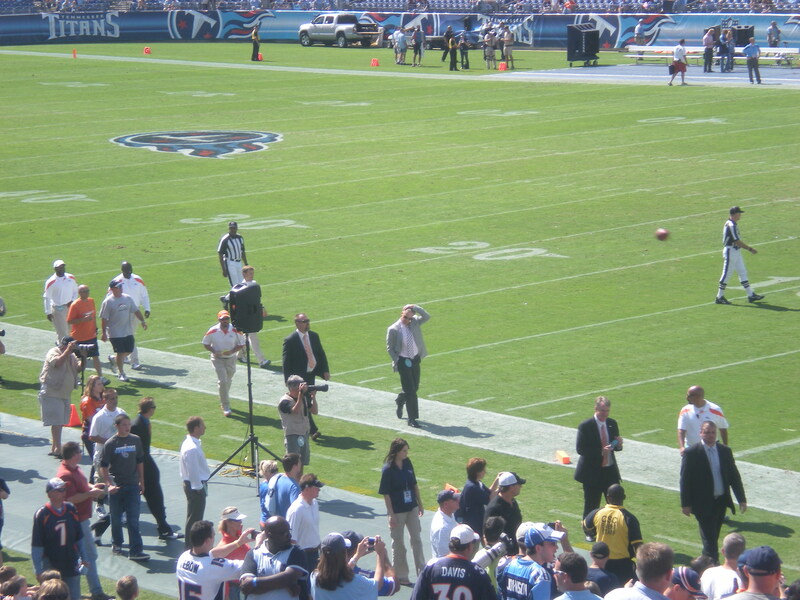 Denver was leading 14-10 and the Titans fans were getting ugly, so I decided it was a good time to leave. I walked back across the bridge and met Mom. We had a nice lunch, and I got to see the last quarter on tv at the bar. Denver lost 17-14, so I didn’t miss much. We left Nashville at 4 and were back in Memphis just after 7pm.